It’s a place where breaking away from the norm is not natural. Acting hard and closed off is part of the daily routine. 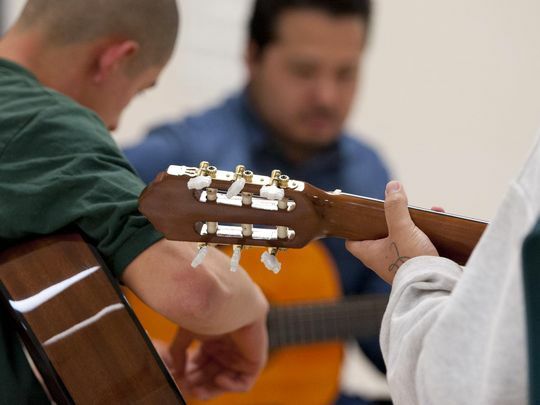 But sometimes, all it takes is for one brave individual to step up and sing a song to change the perception of an entire class at the Tulare County Probation Juvenile Detention Facility. It’s something that’s been happening often during the new Upbeat Music Program at the probation department’s Juvenile Detention Facility and its neighboring Youth Facility. The music program, which is an extracurricular activity, is the only year-round arts program at the two facilities. While at the facilities, the minors attend school daily and are also provided with the basic necessities of life. The Juvenile Detention Facility houses minors charged with crimes while they await court action. The Youth Facility is a dorm-style commitment facility. To be part of the Upbeat Music Program, students must behave, pass their courses and receive an entry from the learning director. Find something they want from you and help build relationships, he said. Vaca began bringing his guitar, playing simple tunes and the kids were interested. They wanted to learn. He knew he had found what they wanted from him. The Juvenile Detention Facility and the Youth Facility began to talk and they asked Vaca to start a formal class. Music class began to take place before school, after school, and on some Saturdays. For four years, Vaca taught the basics of playing the guitar. It was all that was available because it had been more than 30 years since he had even touched his guitar. Once Rodriguez got through some of their attitude, which he said isn’t always necessarily their fault, all of a sudden their true colors start coming out and they have a willingness to learn. Vaca agrees and knows the students really enjoy Rodriguez’s presence on campus. Very few people that aren’t professional singers will ever sing a cappella in front of others. In the Upbeat Music Program, it’s happening more and more. The program is also causing students to open up with family at home. There’s the case of the student who wanted a guitar to start playing with his grandfather and the student who began going to church with his mother to improve his skills. Others have started playing with their siblings and cousins. The class is building confidence, self-esteem, motivation and discipline that’s also crossing into the academic world for them. For one student who couldn’t be identified, the music program takes his mind off things and makes him happy. Vaca said this student is his most talented at the moment. Assemblies are held twice a year at the end of the semester. That’s when the Upbeat Music Program can show what it’s been working on. The performances at assemblies are like part of a sub-culture only a select few can witness. Those that do walk away moved. Vaca has seen parents, teachers and even officers cry when the kids begin to perform. Even if they never play music again, they will never forget their performance. For the last four years, students have come and gone, but the music program remains. After assemblies, teachers and administrators always see an influx of interest in the program. Interested has also grown lately thanks to a music CD the class recorded. Kids are constantly asking for copies and playing it whenever possible. Recently, the Central Valley Vietnam Veterans group, which says it tries to help kids in any form or fashion, donated $200 to the music program. Part of the funds were used to record the CD. During music class, teachers have also noticed people who wouldn’t normally mix together because of their backgrounds are now working together to create a sound and be part of something. Teachers, including those outside of the music program, agree that the program is making a difference and influencing these young people. If the kids never play again after leaving the facility, Vaca’s thought is that one day they may have a son, daughter or grandchild they might be able to pass that gift on to.